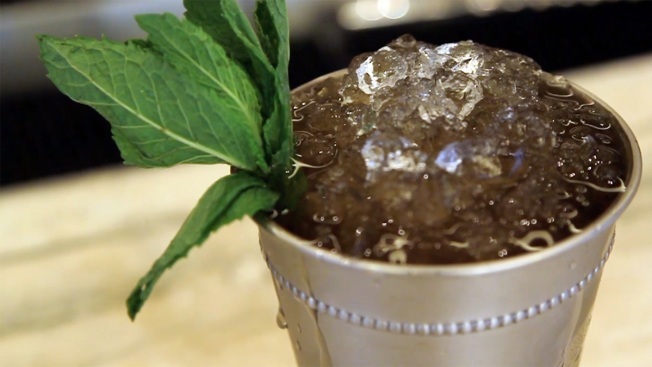 Each year, over the course of one spring weekend in May, nearly 120,000 mint juleps are sipped, slurped and supped at the Churchill Downs Racetrack in Kentucky. It’s been that way for nearly a century, since the julep became the event's official drink, thanks to the influence of Colonel Matt J. Winn, according to the Churchill Downs website. Winn, who grew up watching the derby from a seat in his father’s grocery wagon, became the track’s vice president in 1902. When he took that role, Churchill Downs had been facing some financial troubles. Winn is credited with coming up with a number of now-famous derby traditions, including the garlands of flowers worn around winners’ necks, playing the song "My Old Kentucky Home," and the mint julep glasses, which Winn designed. Watch the video above to learn how to make the drink at home.